Ivalo orthodox St. Nicholas Church is located in the center of Ivalo village. Built in 1960. It was a small Chapel until year 1994. At the time, after renovation, it was consecrated as a church. St. Nicholas day is on 6 December. Orthodox Church of Lapland covers almost whole Lapland. 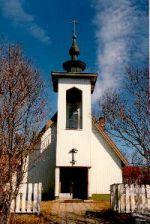 Main Church is in Rovaniemi.